Like all Natural products? I got an opportunity to review OraMD. It's is a liquid Toothpaste, Mouthwash and Breath Freshener. All in One! 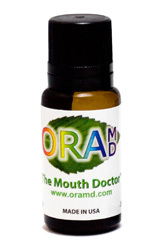 OralMD is a 3 in 1 Oral Care Solution. It serves as a toothpaste, mouthwash and breath freshener. It last approximately 1 month. It is made with 100% Almond, Spearmint and Peppermint Pure Botanical Oils. OralMD cleans and polishes teeth but does not contain a whitening agent. It is fluoride Free so children as young as 3 can be safe using it. It tastes a lot like Altoids in liquid form. It comes in in a bottle with a built in dropper. It was a little messy the first time I used it. Their was a warning it would be strong and it definitely was. My cat was sitting next to me and followed me around for a while because I smelled minty fresh. After reading the ingredients, I was the most concerned because it did not contain fluoride. All though it is safe for kids 3 and up the lack of fluoride would prevent me from using this with my kids or on a long term basis. I did notice that the Pure Botanical Oils in OraMD have anti-bacterial qualities, so it should clean effectively. I dropped the recommend 2-5 drops on my tooth brush and added a little water. It was really strong. Unlike regular toothpaste it produced no foam action but it did effectively coat my entire mouth. It worked as well as any other Mouth Wash. There are Less chemicals so that is a large plus. Tooth brush with Nylon bristles requirement and that foam cups and Polystyrene Plastics will not hold up to the menthol in this product. Visit the OraMD facebook page.